With this last week’s morning temperatures in the mid to early 20s, we feel really good to have most of the fall work completed. The feeling of satisfaction is a great feeling. 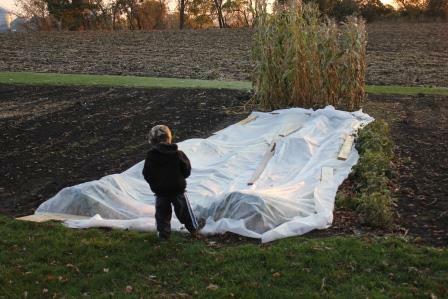 We harvested the last of the popcorn – the blue and the white popcorn. It was a good harvest. A surprise we did not expect this kind of yield. Looking forward to shelling the popcorn this week. Keith was tall enough to reach the ears to harvest the popcorn. 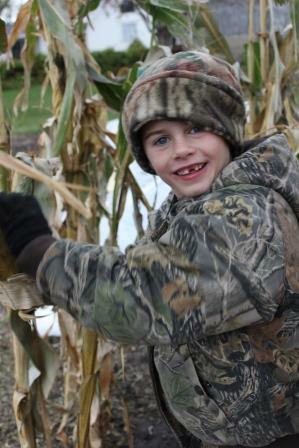 But, the ears were so high up on the corn that Sam could not reach them. 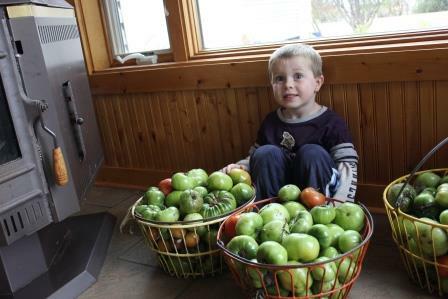 He had to stand in his Red Flyer wagon to reach them to harvest. 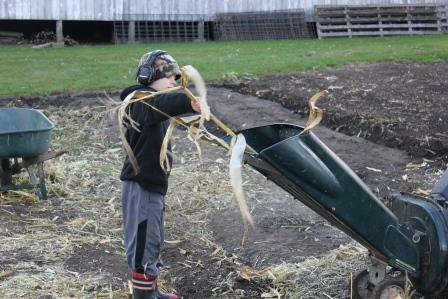 We told the boys that this is the way their Grandpa used to have to harvest an entire field of corn when he was a kid. 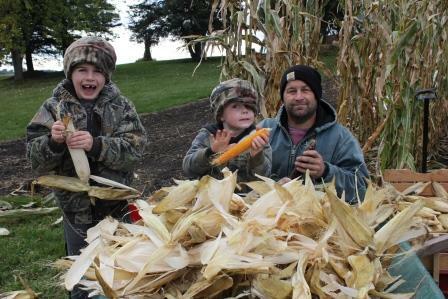 They were more than happy to have the opportunity to ride in Grandpa’s combine and compare the difference. Mechanization is a great thing! It not only makes the jobs easier and more enjoyable but it also improves efficiencies to grow more food for more people to decrease on starvation that would otherwise occur. 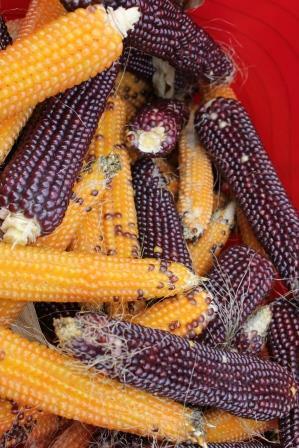 The popcorn ears were beautiful and did have some cross-pollination between the varieties. This means that some of the blue popcorn had a few white kernels and some of the white popcorn ears had a few blue kernels. 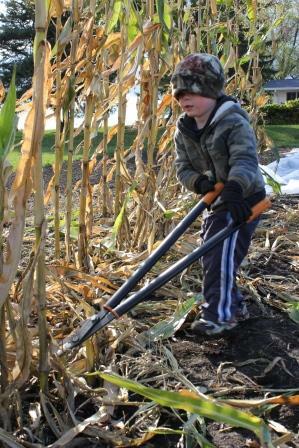 After harvesting the popcorn, Sam wanted to take the lead in cutting down the stalks. He completed this task of cutting all of the popcorn stalks down by himself. To say he was exhausted and proud would be an understatement. Keith assisted Steve with the shredding. Keith has been a real trooper with this project. It can be fun when you get to shred “cool” stuff like tomatoes, kohlrabi, carrots etc. But it can be a laborious job. Sam is my awesome tomato harvester. 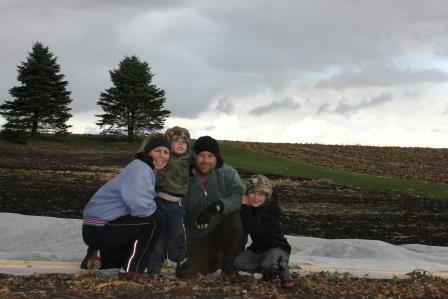 Before our first frost was expected, Sam and I were out harvesting as many tomatoes as we could find. This included using a head lamp for a light. I wish I could have gotten a great photo of him wearing his Lightening McQueen headlamp. Keith and Steve did get home to help with the end of this project as well. 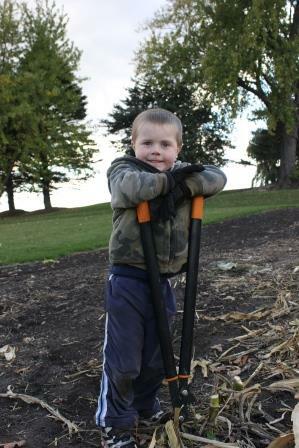 We also had a small test plot of sweet potatoes. We tried growing them last year, and it did not work. 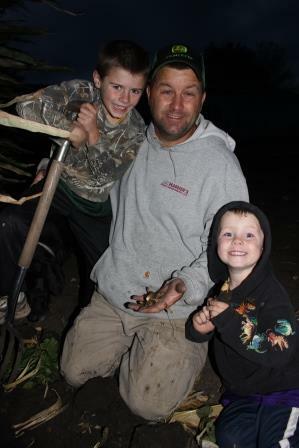 This year some grew, but we will be lucky to get one meal out of what was produced. 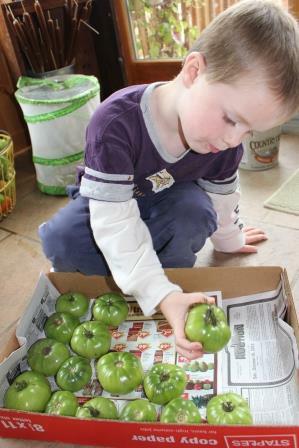 Sam wanted to close a few boxes with just a little bit of air flow, and the others are open to see if this makes a difference in how the tomatoes ripen. 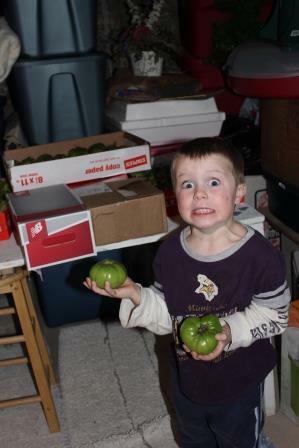 We then placed them in the basement, and the waiting begins. Another science experiment was to place a floating row cover on top of some of the cold season crops: lettuce varieties, spinach, carrots, radishes and also beets. We want to see how it will protect the crops, and how cold it can get both outside of the cover and underneath the cover before the crops will die. Sam and I made this recipe this week. I double the recipe and put half of the dough in the freezer to bake another week. Definitely improves my efficiencies as a mom. I also love baking with the kids. A great way to talk about where the ingredients come from, and who we know that grows those crops. We used our squash and homemade applesauce in this recipe. I was so busy mixing and making sure that the flour wasn’t flying across the kitchen and simply having fun with him that I neglected to take photos…another time. It also is a great way to discuss fractions and numbers. After we were done mixing the muffin batter, I gave Sam a tub, water and the mixing cups and measuring spoons, and we played in the water learning about the fractions and what they meant. In a large mixing bowl beat eggs, sugar, pumpkin and applesauce until smooth. Combine flour, baking soda, baking powder, and cinnamon. Add to pumpkin mixture and mix well. Fold in mini chocolate chips. Fill greased or paper-lined muffin cups 3/4 full. Bake until they test done. Cool in pan for about minutes before removing to wire rack. This entry was posted in Uncategorized and tagged butternut squash, CSA, factory farms, farming, food, Gardening, kids in the garden, local foods, Northfield, vegetables. Bookmark the permalink.